The slope down to Dalston Junction as seen from Haggerston station. The lights visible in the darkness of the new covered Dalston Junction station are those of trains on the central terminating tracks. A personal opinion but it seems that Haggerston station is a little too close to Dalston Junction station. It will be interesting to see how much passenger custom it attracts. Looking north at the reconstructed bridge carrying Richmond Road over the line. The site of Dalston Junction station is just beyond the barely visible second bridge further up the line (not to be confused with Dalston Kingsland station on the North London line). 1930s map showing the Dalston Triangle. The line from Broad Street comes up from the south. The now disused Mildmay Park station is on the westbound line en route to Richmond. The northern east-to-west section of the triangle, running parallel with Ridley Road is where the original Dalston station was situated and where the current Dalston Kingsland station is. 1981 view of Dalston Signal box looking towards Broad Street Station from platform 4. The Electric tracks are to the right. Top level photo: Looking northward at Dalston Junction station in 1981, again from platform 4. Bottom level photo (move your cursor over the image space to view it): a reasonably similar viewpoint in 2010 of the reconstructed station. The rebuilt railway in 2010. The track seen here is the one that trains will arrive on from the Highbury & Islington direction (when that section opens in 2011). Of interest is the tunnel portal on the right. It goes no further than the brick wall at present but it has surely been built just in case the eastern junction (to Stratford) needs to be reopened (presumably just single tracked). If the eastern junction ever does get reopened, it will take a bit of work. This is the route of it - filled in - looking in the Dalston Junction station direction in 2010. Again looking in the Dalston Junction station direction but from further away. This view is from the Dalston shopping centre car park built on the goods yard site. 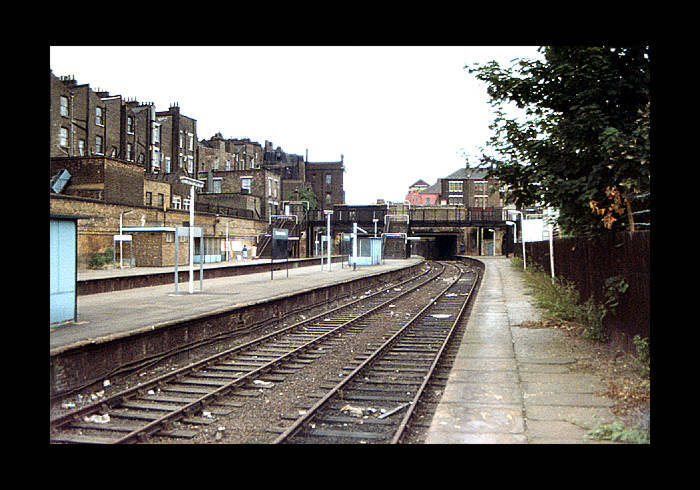 Dalston Junction station southward view in 1981. The area to the left of the tracks is the aforementioned site of platforms 5 & 6. Most of this website deals with the melancholy subject of active railways that have been abandoned, so it is nice to feature an abandoned railway that has been reopened. Dalston Junction station is now completely unrecognisable from its predecessor. The track layout is different: the central two tracks are terminating bays (behind the photographer lies the wide bank of exit steps), the through tracks are out of sight on the far left and right of the station. The train on the left is bearing the signage "First Passenger Train". This was all that remained of any of the original Dalston Junction station frontage in June 2006. Interesting view of Western Junction. 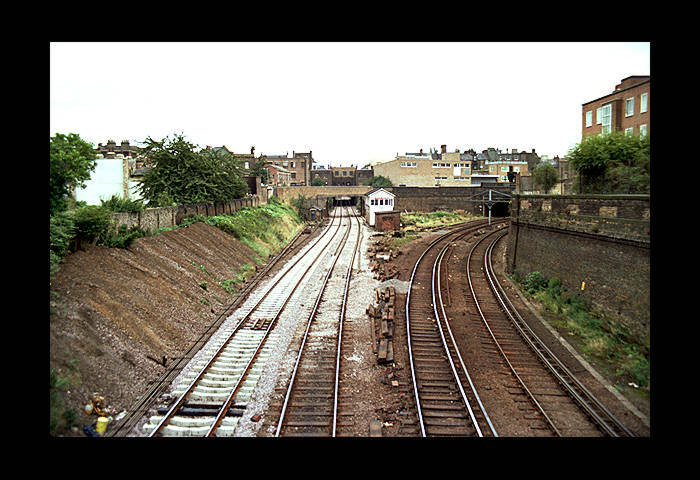 When you look at the 1982 shot, on the right are the electrified lines curving round to approach Dalston Junction. In the background you can make out the old signal gantry. I think this shot was 1982 but it may have been as late as 1984. The new image [move the cursor over the image to see it] shows the trackbed as it stood in 2006. There is little change to the area other than the railway. The retaining wall on the right was rebuilt after a collapse precipitated by the Tunnel Boring Machine for the Channel Tunnel Railway. The up line running tunnel passing just to the left of the retaining wall, hit a lense of running sand which entered the TBM and robbed the wall of support. Photo from 2011 after the re-instatement and re-opening of most of the Broad Street branch, as incorportated into the East London Line extension. Film footage of a cab ride from Dalston Junction to Broad Street is viewable on YouTube.